Guest blogging might be an authentic way to reach out to people but now it's being considered as spammy and hence we should all expect Google to start spanking websites that publish guest blogs. If you're a webmaster who is using guest blogging as a way of building links in 2014, you should put a halt to this immediately. What is the reason behind such a decision by Google? Because, over time, this has become a more and more spammy practice and if you're doing something even close to guest blogging, you're probably hanging out with some really bad company. Previously guest blogging used to be a respectable thing, which sounds much like getting a respectable author to write the introduction of your book. This is not the way anymore. The spam e-mails that have been going on rounds are actually unsolicited. Here's a snapshot of the spam e-mail so that you may know whether or not you're following the herd and whether or not you need to change your approach. So, if you're someone who sends spam email offering money to get links that pass PageRank, you should know that this is nothing but a clear violation of Google's high quality guidelines. Ultimately, this is the actual reason why there are no good things left in the SEO space. While a trend starts off as authentic, more and more people start practicing it and then misusing it until the barest trace of legotimate behavior remains within the trend. So, guest blogging is to be done away with as it's gotten too spammy. You should accept a guest blog when you're clearly willing to vouch for that person personally or know them well. It was in mid-2013 that John Mueller gave some effective advice on no-follow links in the guest blog posts and soon it was seen that tons of people were interested and involved in guest blogging being oversued by a number of low-quality and spammy websites. It seems that most people out there are trying to get the spirit of what Matt Cutts has been trying to say. Matt Cutts would like to add that there are still some good and valid reasons to continue guest blogging like gaining exposure, branding, increasing your reach and participating in communities. These aforementioned reasons always existed and they will also remain in future. 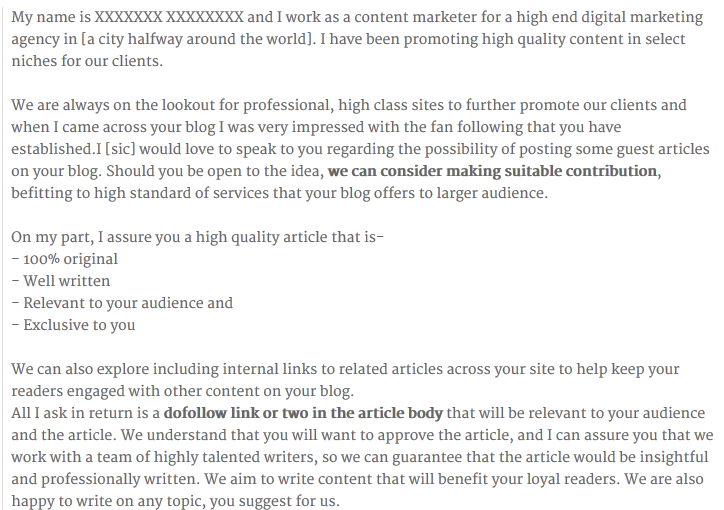 Hence, Matt Cutts strictly prohibits the webmasters and the professionals to receive guest blog article in lieu of links as this is increasing the spammy attempts within the industry. Matt said "If the links are nofollowed, then they don’t affect PageRank, so it would be outside the scope of his team at that point. A high-quality guest post with nofollowed links can still be a good way to get exposure to a new audience, branding, etc."